Dove Lake is a busy place, even in winter. I tried to drive to the lake in the early afternoon but I was unable to get past the boom gate due to high traffic levels. 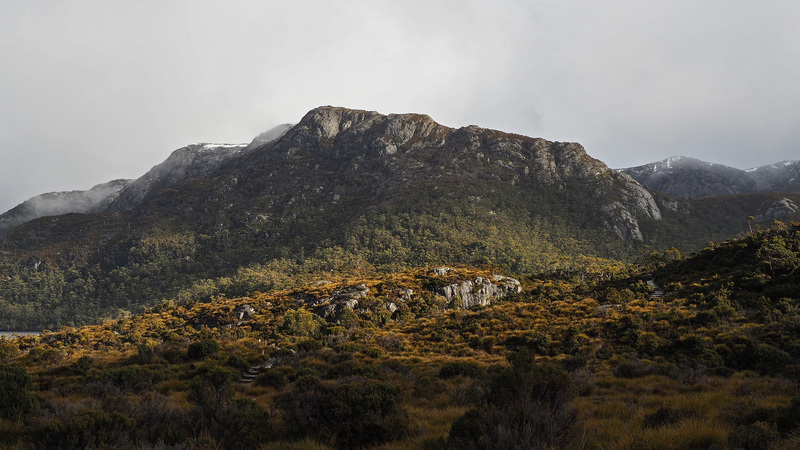 Initially I was a little frustrated but after a quick drive to the Cradle Mountain Visitor Centre I was soon on a shuttle bus and on my way. I have to say that I am impressed by how the shuttle bus system works at Cradle Mountain. Even in the middle of winter buses run every 15 minutes from 9 am in the morning to 3 pm in the afternoon. 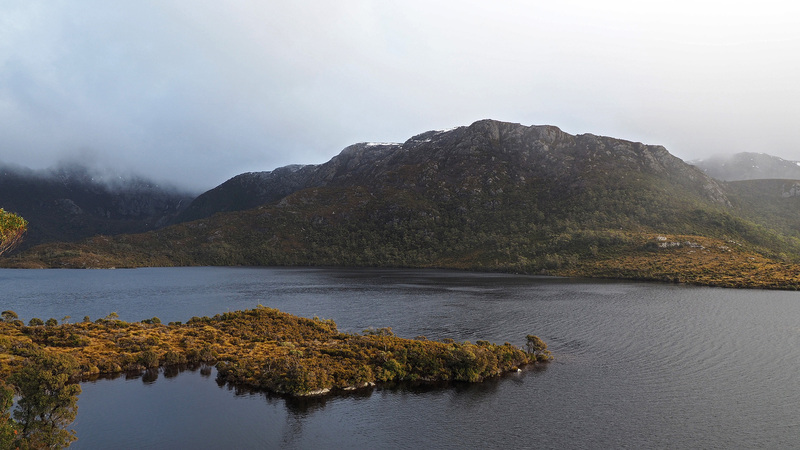 The bus journey starts at the Cradle Mountain Visitor Centre and takes about 20 minutes to arrive at Dove Lake. On the return journey (Dove Lake to the Cradle Mountain Wilderness Centre) buses also leave every 15 minutes with the last bus leaving at 4 pm. The Tasmanian Parks & Wildlife Service has an information page with a map of the shuttle bus route, http://www.parks.tas.gov.au/index.aspx?base=3301. It is a fair system that gives everyone ample opportunity to visit Dove Lake. This is in stark contrast to my experience at several national parks sites in Canada and the United States. I really think the same system should be used in other places where visitor numbers (and particularly vehicle numbers) are extremely high. Once I arrived at Dove Lake I intended to complete the Dove Lake Circuit (5.7 km, 2 hours) as per the map below. Location of Dove Lake Circuit. 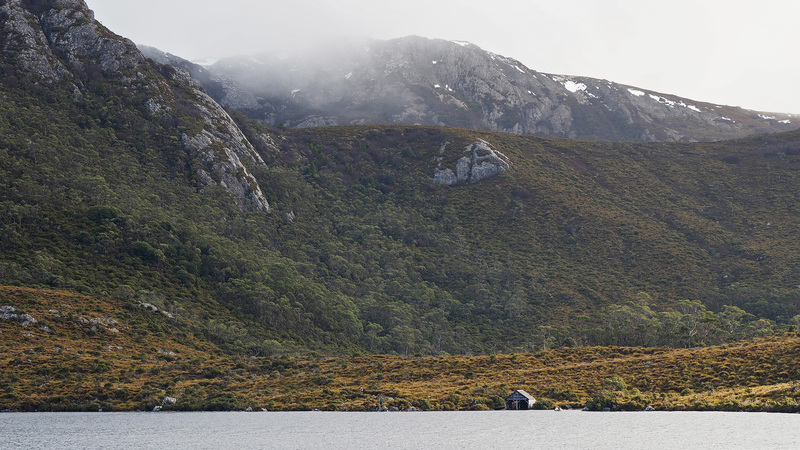 Even though low cloud was covering Cradle Mountain itself the view of the surrounding countryside was spectacular. I was immediately drawn to the way the light was shining on Wombat Peak. Wombat Peak from the start of the Dove Lake Circuit. 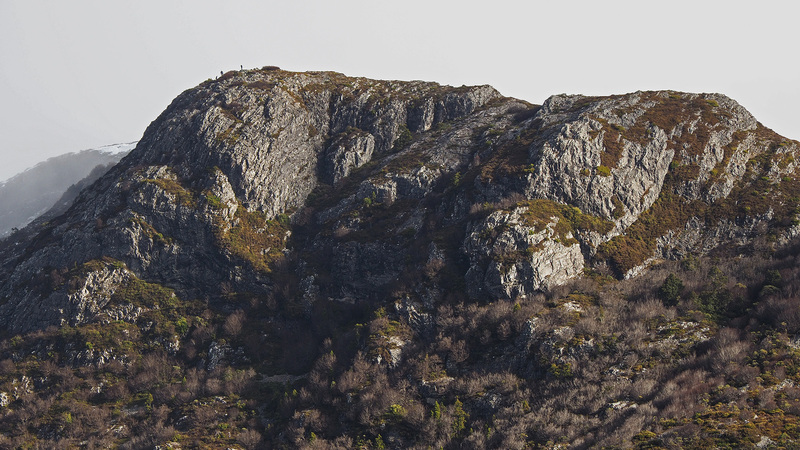 When I zoomed in with my camera I could just make out a group of people who had made their way to the top. A close-up of Wombat Peak. If you look closely you can see some walkers at the top. From the car park I headed in a clockwise direction towards Glacier Rock. As I made my way there I remember thinking how grateful I was to be walking in partial sunshine. Throughout the day it had been raining on and off but at the start of the walk the weather looked like it was clearing. Maybe I was being a little optimistic? In any case I was enjoying the views across the lake and I could see the famous Dove Lake boat shed on the opposite side. The famous Dove Lake boat shed from the opposite side of the lake. It wasn’t long before I reached Glacier Rock and when I did I was disappointed to see that it had been fenced off for construction/safety purposes. I may have poked my head through anyway for a cheeky look at the lake. Dove Lake from Glacier Rock. As I continued along the circuit light rain began to fall and a stiff cool breeze started blowing across the lake. Before long the light rain turned into heavy rain and the entire landscape changed in front of me. Even though the weather had deteriorated I was really enjoying the opportunity to be walking in nature and to see a type of landscape I had never seen before. 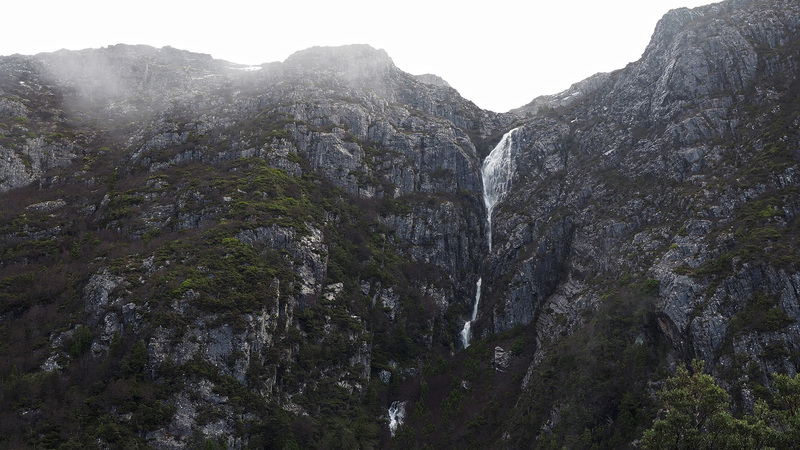 Yes it was cold and wet but the rain had caused a number of waterfalls to flow rapidly over the sides of cliff faces. It was amazing to see and hear all the rushing water around me. 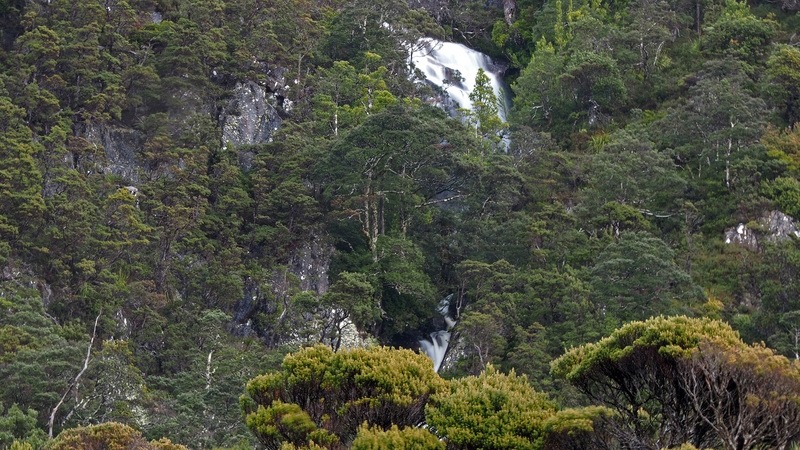 A waterfall flowing above Dove Lake. Another waterfall flowing above Dove Lake. Just as I was starting to tire of the rain I found myself entering a lush rainforest, the Ballroom Forest. It was similar to the forest from the Enchanted Walk and with the shelter of the canopy above me I enjoyed a short respite from the rain. 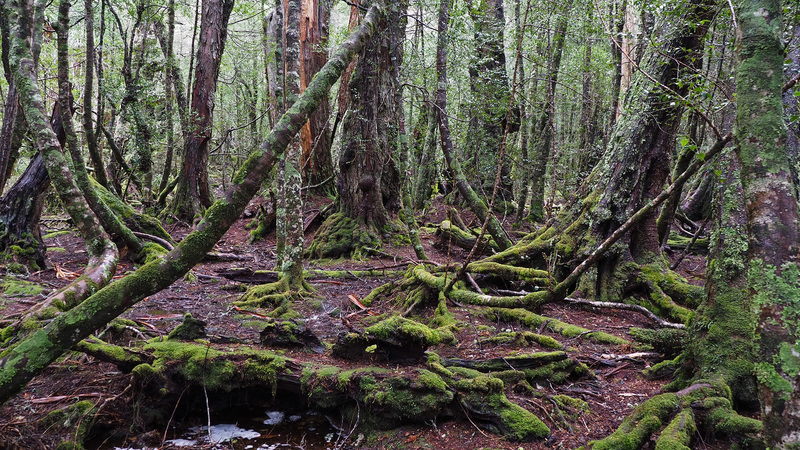 The Ballroom Forest on the Dove Lake Circuit. 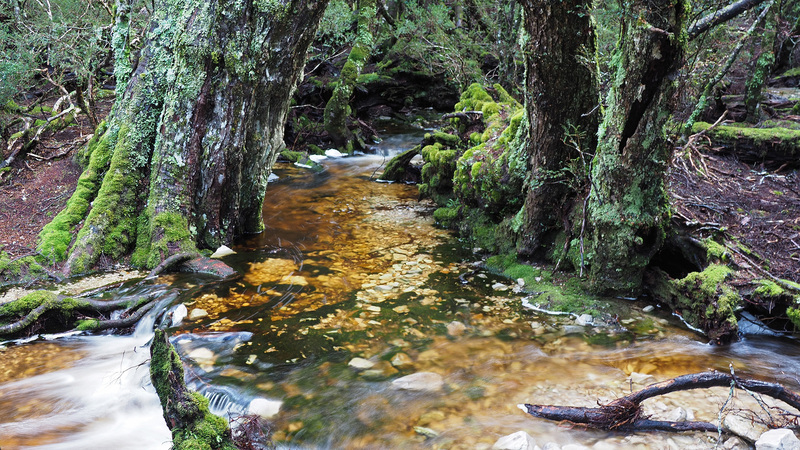 Streams flowing in the Ballroom Forest. I soon realised that I would need to pick up the pace if I was going to make it back to the car park in time for the last shuttle bus. So I hurried along, only stopping briefly at the famous boat shed for a quick photo and a chance to catch my breath. 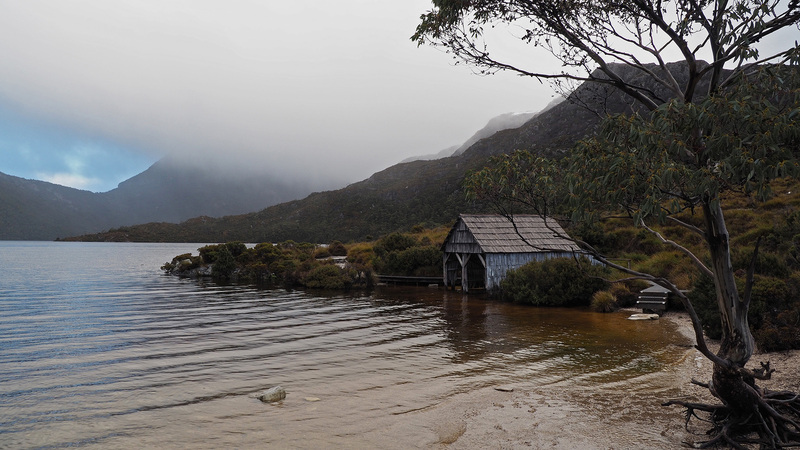 The famous Dove Lake boat shed. It was at this point that I realised the new boots that I had bought before this trip were not suited to my feet as they were just that little bit too narrow. My feet were killing me! At least the boots had kept my feet dry and warm. I looked at my watch and realised that I would have to run back if I was going to make it in time. Wincing in pain, I jogged to the car park to see the last shuttle bus pull up just as I made it over the hill. There was a long line of people boarding the bus which bought me just enough time to make my way across the car park. I was so relieved!